So you have a drone – what are you going to do with it? Fly it aimlessly around your yard? Spy on your neighbors? Use it to drive your dog crazy? While it’s true you can use a drone as a toy or an object of amusement, drone owners have the potential to hop onto the tech bandwagon (and a deep well of drone business ideas that are taking off daily) to put their new gadget to use in an even better way: making money. Drone-related businesses are on the rise, while more and more industries are becoming more comfortable utilizing drone technology within already booming businesses. From construction to media, more industries realize there is power in drone technology. 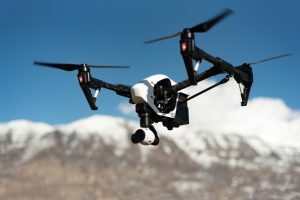 If you have a drone, a passion for the outdoors and you know how to use both of these assets responsibly, there are job possibilities just on the horizon – so why not see if any of these are the right fit for you? This can go one of two ways – regular surveying or surveillance. Property surveying is the act of mapping out a property for a specific purpose, whether it’s to decide property lines or put up a new fence in a specific area. Surveying used to be hard, cumbersome work, but drones are making it much easier. What used to be a job full of walking and mapping is now as easy as letting loose a drone and sitting down in front of your laptop for a few hours. Surveillance is also another way to utilize a drone for business. Is there a big event going on? Is someone curious as to how their cattle keeps escaping their fence line? Insurance companies have hired investigators to obtain aerial images of insured public events and spaces looking for code violations, falsification of insurance applications or under-insured activities. Drones can be used to survey property in the interest of finding out information and keeping an eye on things as well. Drone business ideas in the security space are skyrocketing. Drone conservation jobs can be extremely fulfilling, and this is especially true if you’re someone who loves nature and exploring the great outdoors. More and more parks and preserves are using drone technology to track and locate animals within the park for conservation and observation purposes; the stories are numerous and growing in number every day. Think about a mountain lion that’s been tagged for study. She’s recently gone into labor and the pregnancy might be difficult for her. Conservationists can use the GPS tag in tandem with a drone to locate the mother mountain lion and keep an eye on her actions without stressing her or putting themselves at risk. While starting your own non-profit conservation-centered corporation may not necessarily sound like a practical plan, drone business ideas in the conservation sector abound. Plenty of grant money money is available for the determined UAV pilot who wants to make money flying drones. Drones have the capability of sniffing out information where humans may not be able to – or at least, they may not be able to without breaking quite a sweat. On property and land that has its environmental compliances being called into question, a human can take days to check and go over every inch of the property in question. A drone can do it in a fraction of the time and at a fraction of the expense! Drones show us what we can’t see – an aerial view of the world. As drone technology matures, our willingness to accept drones as commonplace does as well. Now is the time to take action, make money with your drone – but be safe, 100% legal and in compliance with your local regulations – and be a part of an ever growing movement. Do you have original drone business ideas I can help you get off the ground? Tell me about them in the comments below or use the contact form to reach me directly! I am new to this aspect of making money with drones, any tips for a beginner? where should I start? Thanks for sharing this article. I believe that drone business is great for business. There are now a lot who have a business with it. I want to start a drone business too here in our place. I think that it will be profitable.